​The MERIT Electronic Health Record Viewer is now live across all four of the partner Trusts. Clinicians can now use this to view aspects of the health records of patients from neighbouring trusts in the event that they require either inpatient or outpatient care outside their ‘home’ trust. This allows professionals to see a basic dataset about a patient, rather than needing to ask a lot of questions at what may be a difficult or distressing time for service users or carers. Typically, the first teams chosen are those which provide crisis care as it is perhaps more likely that they will come into contact with patients from outside their own local area. An interactive training video has been produced to support the roll-out of the system, and this has been uploaded to each trust’s intranet or training system so that professionals could familiarise themselves with it prior to the launch. 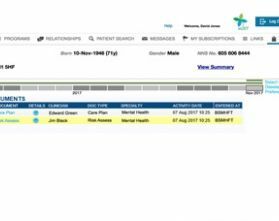 "We are finally able to present the Electronic Health Record Viewer after almost two years of work.This project has been a joint effort between clinicians, ICT staff and project managers, together with our specialist IT partner Intersystems, and we have delivered a product which can be used in mental health trusts across the West Midlands.